In the late 1960's and early 1970's, breedings between the smallest Australian Shepherds resulted in the Miniature Australian Shepherd. Constant breedings to the smallest puppy in the litter produced an even smaller breed; the toy variety. The Australian Shepherd originated in Australia, but the Miniature Australian Shepherd was first bred in the United States. There is actually a tea cup size for the Miniature Australian Shepherd. 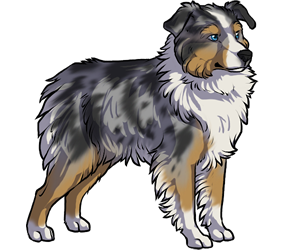 The merle coloration carries a blind/deaf factor. Ironically, the breed was bred in America not Australia.